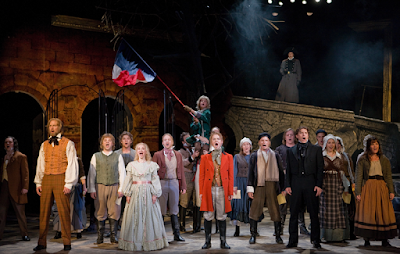 I saw the Finnish/Swedish production of Les Misérables at Åbo Svenska Teater for the second time yesterday. There's a Swedish-speaking minority in Finland. 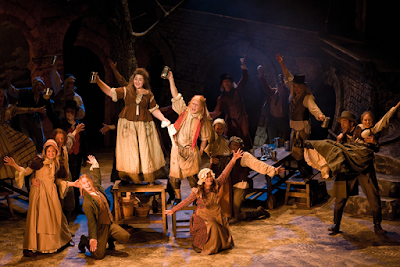 That's why the musical, even though it is performed in Turku, Finland, is sung in Swedish. A lot of the actors are Swedish and the rest are Swedish-speaking Finns. I understand only the basics of Swedish. But that didn't matter yesterday. I enjoyed the show immensely! Now, let's go through the show, shall we? I'll leave out the parts similar to the London original and describe mostly the differences. Prepare for a long rant! Overture to Valjean's Soliloquy: When the audience sat in the small auditorium – my seat was in the fifth row and in the middle, a great spot! – we could see there were some bridge-like structures on the sides of the stage and a leafless tree growing from the middle of the stage. The first balcony was lined by a bridge-type thing the actors could walk on during the show. Due to the theatre being quite small the Overture was not as grand as usually, but it did a fine job. During the Work Song (Se ner) the convicts tried to cut the tree by pulling a chain tied around it. 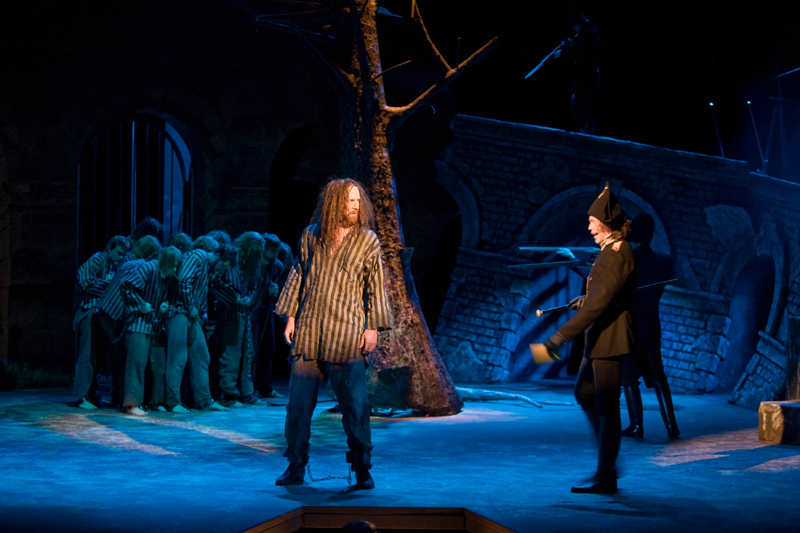 The cleverest point of the scene - which I hadn't noticed the previous time - came when Valjean came onstage with another prisoner: a big branch fell from the tree on the other prisoner and Valjean lifted it off him. That was such a good moment of foreshadowing! This was the first time the balcony around the balcony was used, Javert entered through it and sang his first lines from the back of the auditorium. Sören Lillkung's, who has already played the role in Helsinki eleven years ago, Javert was awesome from the first minute. He made Javert's disgust of all things illegal clear from the first moment, offering Valjean his ticket of leave and dropping it to his feet at the last moment. Alexander Lycke sang his first soliloquy (Vad har jag gjort?) really well. He was a joy to listen to through the show. At the End of the Day to Lovely Ladies: At the End of the Day (När en dag ör förbi) begun with only the male members of the ensemble singing the first verses. I thought that sounded really great. When the show progressed, I noticed Fantine, Thérèse Karlsson, had a friend who tidied her up to get her paycheck from the foreman. Does she have a friend in the original? Who Am I to Confrontation: Who Am I (Vem är jag? ), another great-sounding Valjean soliloquy, used the balcony thing again, having jury and Javert there. Fantine's Death (Kom till mig) was very touching, and when Valjean prayed for Fantine's soul Javert entered the stage and the music prepared for Confrontation... Awesomeness! Confrontation was really good, but after it came the part one can agree or disagree with: Valjean had a gun, which he pointed at several people and in various points. Maybe it's a little out of character? Anyway, instead of shooting Valjean kicked Javert a couple of times and ran off. Castle on a Cloud to The Waltz of Treachery: The little Cosette I saw last time was quite a lot better than this one - yesterday's little Cosette was really cute, but her voice left quite a lot to hope for. 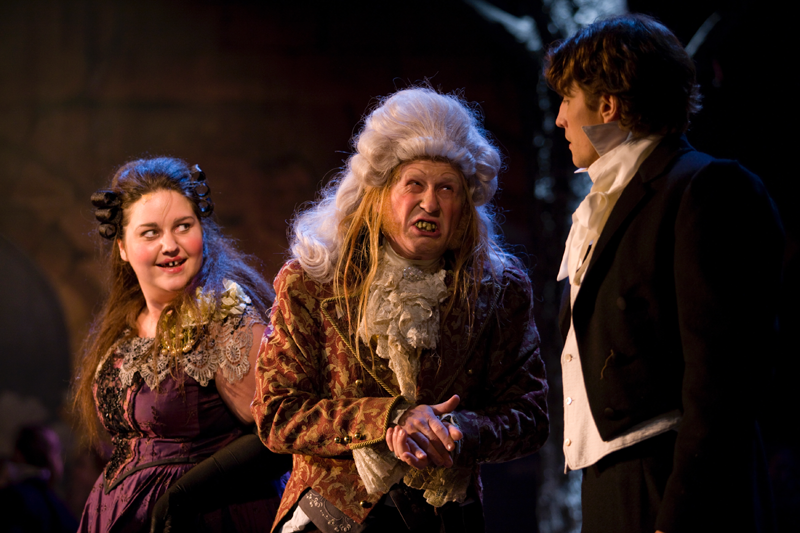 Mme Thénardier, Daniela Franzell, however, had a strong voice and was awful towards the poor little girl - just as supposed. Master of the House (Herre i sitt hus) didn't get so many laughs as it gets in London. I guess there are two reasons: at least half of the audience was Finnish-speaking, and they had to rely on the subtitles on top of the stage (taken from the Finnish libretto of the show. Not so very well translated, I'm afraid – no one tells the enemy to "go to heck" in the middle of a fight, and neither does Valjean tell God to "do your job! "), so they probably missed some of the Swedish jokes, just like I did. The another thing is that Joachim Thibblin didn't play Thénardier so much for the laughs. There actually was a quite vile vibe about him. In The Waltz of Treachery the usual Colette-Cosette joke was replaced by some Cosette-Cotlette joke. Weird Swedish humour? I've no idea, I didn't understand it. But the Thénardiers were very unlikeable and horrible here, and Valjean had to flash his gun again. Then he dropped the money to Thénardiers' feet – just like Javert had dropped the ticket to his feet earlier. Valjean dressed Cosette in a new costume and they took a turn around the stage. Behind the tree little Cosette changed to big Cosette, Marika Westerling. From where I was sitting I could see the change, but the previous time I sat in a seat where it seemed Cosette had magically grown, which looked nice. Sorry for posting this picture from one of the previous posts again. There is something wrong with the one I had in mind, it won't download. Look Down to Stars: Bad luck with the kid actors this time. Yesterday's Gavroche was also a little worse than I saw the previous time, even though the previous one was almost as tall as the ABC boys... But Look Down looked great with barrels with little fires and poor people around them. Enjolras, Marius and a couple of other students were watching the events from the balcony. Stars (Guds Stjärnor) was beyond awesome. Lillkung has also sung opera roles, and you could hear that. His voice was so strong and beautiful, I could've listened to him the whole night. Worth noticing of the staging was that the stars lit up in the back of the stage, which looked good. After Stars I started noticing how much the other members of the audience loved the show, too: the applause was big, and when Gavroche came in and sung his little part he got almost as big an applause, which hadn't happened the previous time. ABC Café to Do You Hear the People Sing: This time I had the feeling there was something familiar with Marius, Glenn Nilsson. I thought about it and suddenly it hit me: he looks just like Hugh Grant! Maybe it doesn't show from the photos, but if you see him live, I bet you'll agree! The scenes with the students were my absolute favourite parts of the show. They were wonderful, packed with awesome moments, like Grantaire (Tore Norrby) teasing Marius about Cosette and jokingly almost kissing him. Then the two have a mock fight, which Enjolras, Rune Sæter, stops with the most awesome solemn gaze. Nilsson's "skoja!" ("Just kidding!") adlib was so cute, it fit the moment perfectly! The students also swore a a blood oath to fight for a better world. 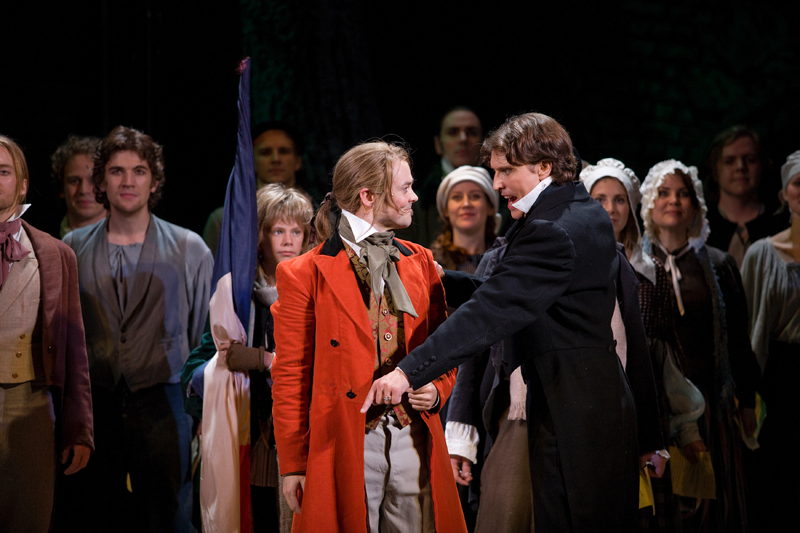 I love how this production lost Enjolras' vest and gave him the lovely red coat, as seen in the picture above. I've a feeling that usually, no matter how non-replica a production of Les Mis is, the vest is there, along with Valjean's beard and Javert's sideburns - the latter two were present here also. 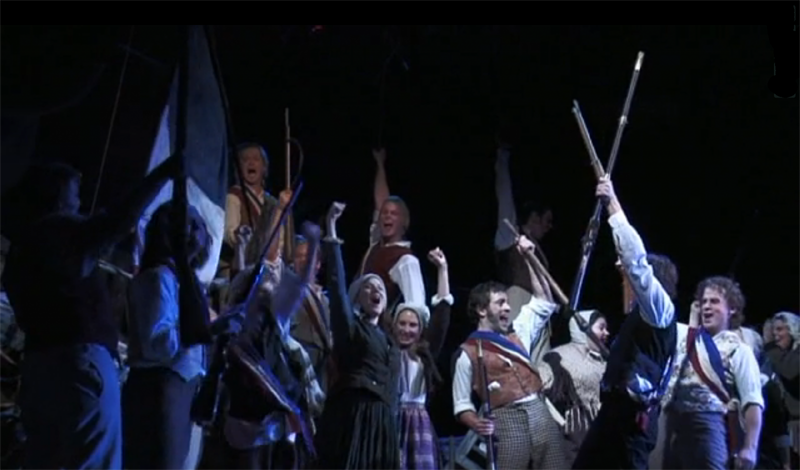 Do You Hear the People Sing (Folkets Sång) was way beyond awesome, too. The guys sounded so, so good, and the female ensemble backing them from the balcony made the whole song even more beautiful. I liked how they used the French flag instead of the red one. Wonder why they chose to use the red flag in London? Rue Plumet to One Day More: Marika Westerling's, who played the role in Helsinki eleven years ago, Cosette was the cutest thing imaginable. She was so pretty and totally adorable with her blond hair and lovely smile, and her light dress was so much better that the black lampshade they give the poor girl in London. I can't imagine a better Cosette, she had a beautiful voice and made the character really likable. It was easy to understand why Marius would love this girl! Marius was also too adorable for words here. He climbed a tree to get to Cosette's garden, fell from it and was so embarrassed when saying "I'm doing everything all wrong" that you couldn't help but feel for him. And together Westerlind and Nilsson managed to be really, really cute without being overly sappy – I haven't seen so many Mariuses and Cosettes, but these two were definitely the best of those I've seen! Javert had a beanie when he disguised as a revolutionary. I don't know about me, but just the thought of Javert wearing a beanie makes me giggle a little inside. Little People worked well, with Gavroche pointing a huge gun at Javert, helped by a student who may or may not have been Combeferre. A Little Fall of Rain (Ett litet stilla regn) was adorable. 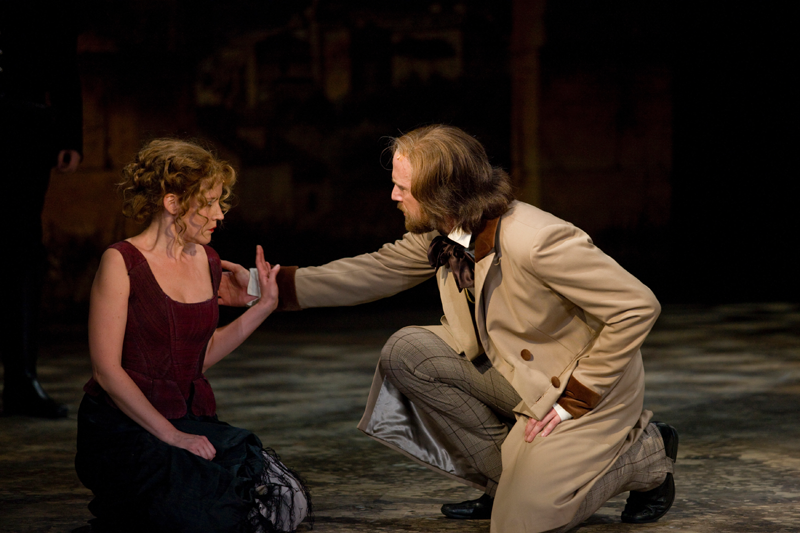 Marius was so sweet here, and after Eponine's death Nilsson went for the angry approach with "her name was Éponine! ", as if to say "See, this revolution of yours is not so awesome after all!" Valjean letting Javert go was Valjean's Moment of Awesome I mentioned before, Just because of one word. Lycke packed so much to the simple two letters of the word "gå" that I almost felt like rising from my seat and leaving – no wonder Javert did leave after being told to do so with that tone! It's odd a single word can be so impressing, but here it was! What's the deal with having no barricade photos, Åbo Svenska Teater? Have a sad trailer screenshot of poor quality instead. 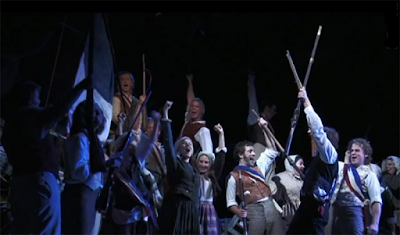 First Attack to Final Battle: The barricade didn't turn in this production. Instead, it was in the left side of the stage, and it was partly composed of the tree which had been lowered from the mid-stage. The audience could see the National Guard attacking from the right. Such a good add. I found it really touching there was a lady on the barricade with a baby. I felt so relieved when she left after Enjolras let the women go! When the ladies were hugging the students for goodbyes Enjolras looked interestingly sad. What was it? Realization of how this isn't going to end well and how he is making his friends' girlfriends and wives widows? Or maybe longing to have someone who to hug himself? I don't know, but I love little moments like these in shows that give me something to think about. 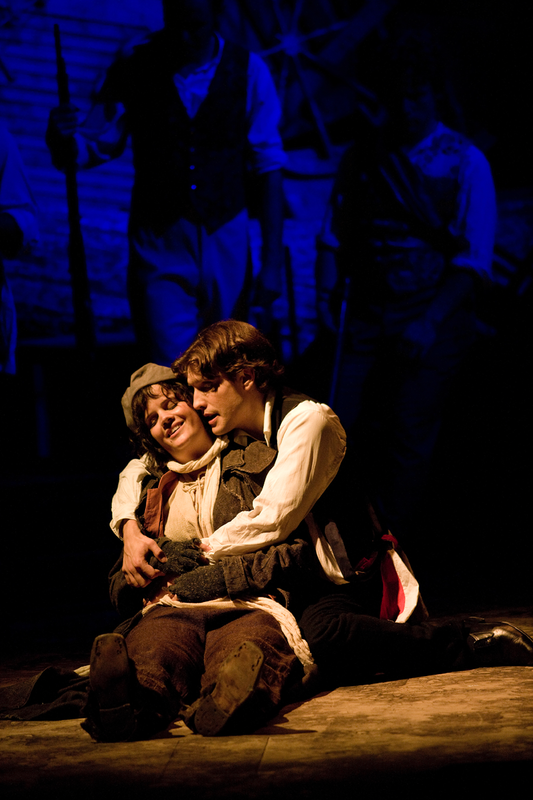 Gavroche's Death, as usual, was just horrible. The audience was so well in the story: usually there's always someone who giggles after the loud bangs, but not here. Gavroche's body left lying on a little bridge on stage right, along with a couple men of the National Guard who had died in The Second Attack. The Final Battle showed the both sides of the fight again. Bodies everywhere, on the barricade and on the right side of the stage... In this version, Enjolras was actually the last to die, just as in the book! After being shot he struggled to get the French flag secured to the barricade before breathing for the last time. Sewers to Turning: The orchestrations of Sewers and Dog Eats Dog made a good impression. The orhcestra might've been small, but somehow in these scenes it struck to me they really took the most out of it! Besides sounding good, Dog Eats Dog (Hund äter hund) was great in the acting department. Thénardier was creepy, the pulling a tooth out part was subtle but made me feel unconfortable, and it was so sad when Thénardier kicked Gavroche's body to the darkness. 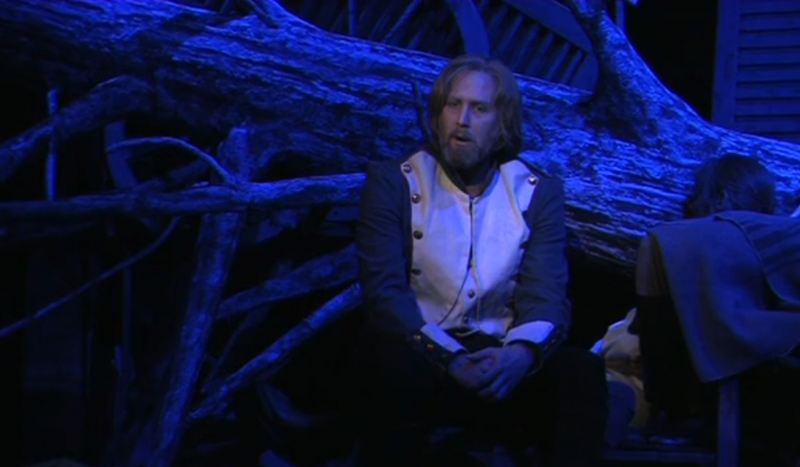 Javert's Suicide (Javerts självmord)... Again, I could've listened to Lillkung the whole night! And here the suicide was done with some style: Javert climbed to a bridge-like thing quite high in the back of the stage and simply fell backwards to the darkness. So much better from the rolling onstage we see in London. Turning, then! I have never liked this song and I've felt it's useless – before this. Here the bodies were onstage the whole time before Turning, and during the song the ladies took the dead men away and partly deconstructed the barricade. Finally the song had some meaning, finally there was some reason for it to be in the show! A huge thumbs-up for this production! Empty Chairs at Empty Tables to Finale: Empty Chairs at Empty Tables (Tomma bord och tomme stolar) was incredibly powerful. I almost jumped from my seat when Marius hit a table with his fist and pushed down some chairs. But it was not just because of his angry actions the song was powerful, it was also due to Nilsson's singing and the wonderful ghost scene where the barricade was illuminated with green lights and the students appeared in a kind of a slow motion, looking happy and sure for their victory. Wow! 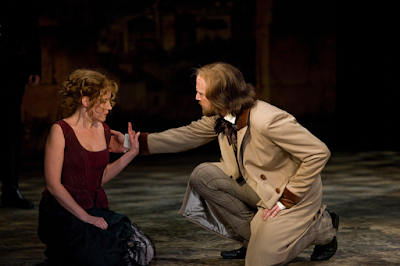 Every Day (Varje dag) in the middle of a fight showed us more Marius and Cosette cuteness. Westerling was, again, really sweet. I just loved how Cosette kindly mocked Marius by mimicing him introducing himself. The ensemble blocked the sight to the stage during the applause. When they left we saw the tree was up again, and around it sat every dead main character of the show in white versions of the costumes they died in. Including Javert. Yes. 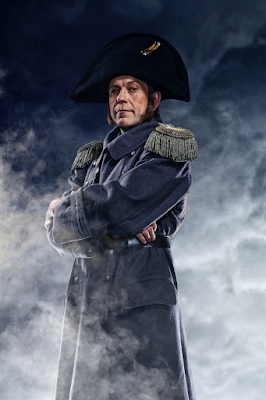 Javert was in the finale. I was yay-ing inside already, and the Finale was so beautiful... Éponine and Fantine sounded so pretty together, and when it was everyone's turn to sing the Do You Hear the People Sing reprise I wished the show would never end. 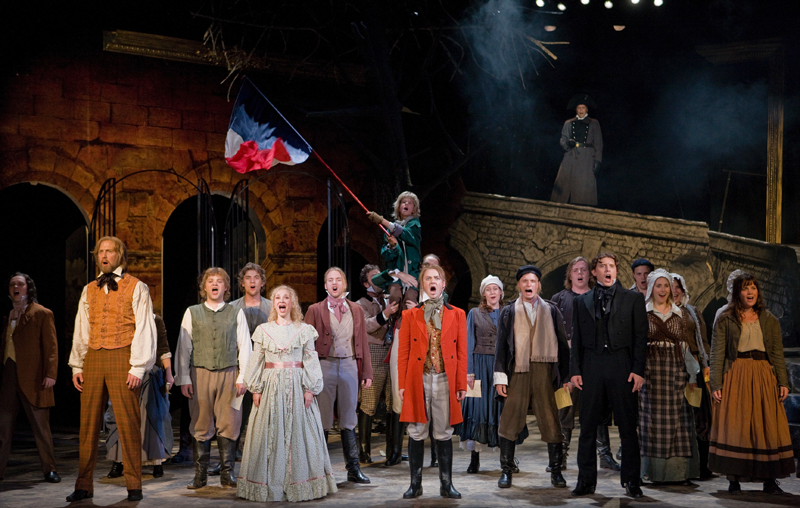 I don't know if I would have put Thénardiers in the first row too during the reprise, though. And then came the last surprise of the evening. Never, never ever have I seen an unprovoked standing ovation in a Finnish theatre (an actor announcing how happy he is to invite Stephen Schwartz onstage after Wicked's premiere counts as provocation). But here I saw that. First we applauded just like the principal of a school I used to go told a polite Finn applauds: no screaming, no banging the floor with feet, no standing up or dancing around. But then, when Lillkung and Lycke came onstage, some faint screams were heard. And when everyone took a bow together people started rising up. I haven't seen a Finnish audience act this way ever before. That's the power of Les Misérables for you! And that's what this fantastic production deserves. Absolutely. Pictures by Robert Seger, Nana Simelius, and from the trailer. A very good review! As you said, the Finnish-Swedish Les Miz is fantastic! 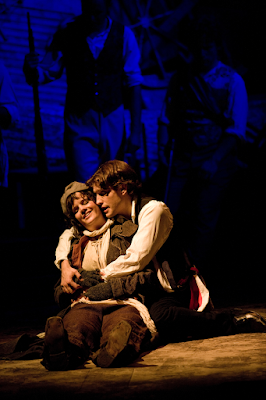 Though I have to disagree with you when it comes to the Thénardiers. You say that their songs weren't the laugh fests they usually are; I think they were! And Joachim Thibblin and Daniela Franzell got the loudest applause at the end. I have seen Les Mis twice (can't wait to the next time).